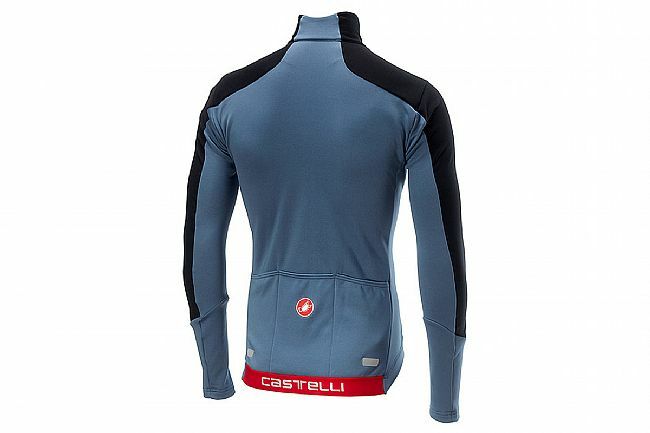 The Castelli Men's Trasparente 4 Jersey blurs the line between jackets and jerseys. Designed for cold conditions that exceed the typical jersey, but don't necessitate a full-on winter riding jacket, this lightweight jacket provides windproof protection with optimal thermal management. Featuring Gore Windstopper® X-Lite Plus front and sleeves, this jacket provides total windproofing for comfortable riding, no matter how blustery, as well as minimal rain resistance for protection from the occasional passing shower. So comfortable that it virtually disappears, the Trasparente earns it's name, which translates to "transparent". 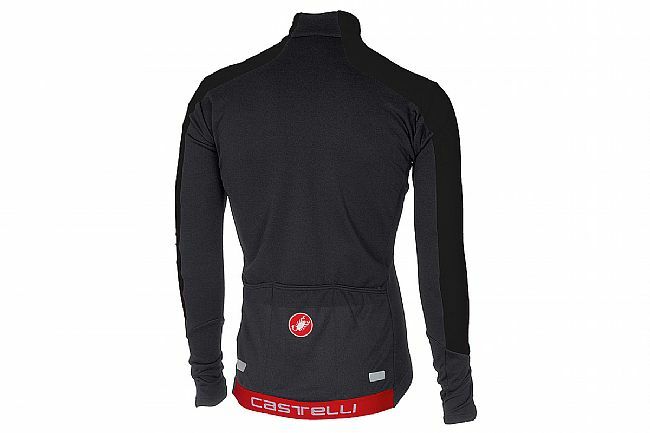 Castelli features a Euro-style fit; if you've never worn Castelli before consider sizing up one size from your normal American sizing. For example, if you normally wear a medium, consider getting a large. If you have any questions, feel free to Contact Us, we're happy to help. Fits like a jersey, yet protects like a jacket. Gore Windstopper® X-Lite Plus front and sleeves are windproof and water resistant. Warmer thermal fabric on back for high breathability and thermal regulation. Zippered chest pocket and 3 external rear pockets. Warm and toasty on a 55 degree day with a Baselayer. Well made and like Castelli fit it runs a little small. So if you want to wear a heavy underlayer they go up a size. 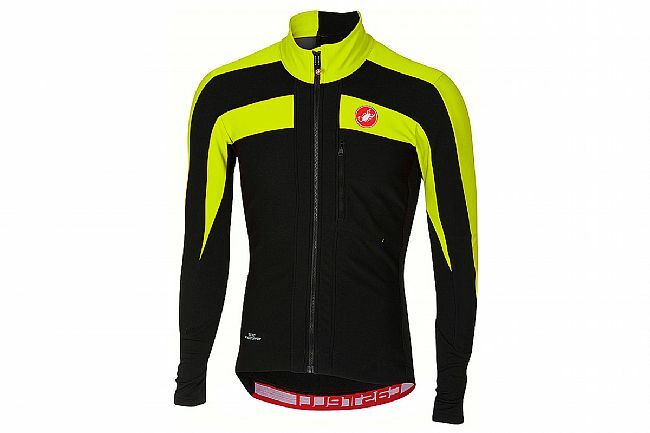 Great cool weather jersey over long sleeve base layer, good breathability yet warm enough for cool temps. Fit is excellent and construction top notch. I got this on sale and it took wearing it a few times to figure out how to use it. Only a cyclist will appreciate this. I thought it was a jersey that's the weight of a jacket. I tried wearing it alone and the neck and sleeves let air in and it wasn't warm enough even at 50 degrees. It's really a wind jacket that fits like a jersey you need to wear a jersey under it to fill space in collar and wrists. Now that I figured that out I've been using it as a shell in weather from 55-35 you can wear short sleeve jersey up to long sleeve jersey with base layer under to control warmth. It's one of the most versitle things I own. Think weather too cool for vest but too warm for winter jacket. As everyone says I'm a medium in everything else but large in Castelli. Best cold weather jersey I have found. I am one of those individuals that sweats profusly when I ride. This presents the problem of wet and cold. This jersey when worn along with a Patagonia silk weight undershirt has proven to be the best combination of warmth and staying relatively dry that I have found. As long as I continue to ride I remain warm. I don't want to stop for long or the wet will turn me cold. Other combinations I have tried have gotten me wet and cold or just cold and unable to warm up at all. As for the sizing of the garment, it runs small, but every bike kit I have ever seen also seems to run small. It seems well made and the zipper works very well. I have routinely used this jersey in the low 30's and have remained as comfortable as those temperatures will allow when on a bike. Get one. You will be happy with it. I use this for road cycling. I like that it blocks the wind very well and is breathable. The fit is excellent. I only knock it down a star because it doesn't have much insulation in the chest area, so a baselayer is practically required. Though, on the flip side, I have yet to feel the need to wear a vest with this, as I would with a normal thermal jersey. So I suppose that cancels out the need for a baselayer. I would suggest pairing this with either the short sleeve or the long sleeve Castelli Prosecco R, depending on how cold it is. I usually find the short sleeve to be fine. I wouldn't suggest a sleeveless, however. Lately it's been around 45 degrees in the mornings here, warming up to around 55-60 by 11, and this baselayer and jersey combination handles that range very well.